This volume is the first of a planned series of casebooks to be published by the Cormac McCarthy Society. 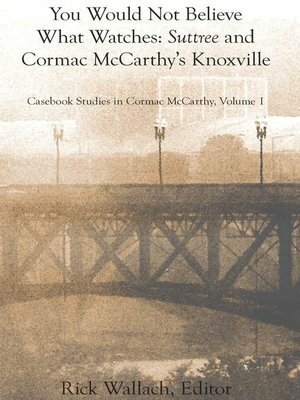 It is an expanded and updated version of the fourth volume of The Cormac McCarthy Journal, originally released in 2006 to celebrate the 25th anniversary of the novel. The original edition consisted of papers and lectures given at the conference, held by the Society in Knoxville in October 2004. The current edition includes the entire content of its predecessor volume, and we have added intriguing essays, anecdotes and firsthand accounts of Knoxville during the historical period covered by Suttree to flesh it out.